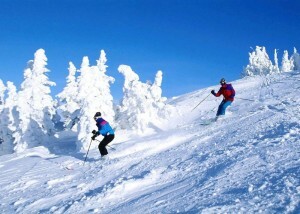 The mountain village of Zermatt, with a population of about 5,800, is one of the great ski and climbing centers of the world. The town lies at the upper end of Mattertal at an elevation of 5,310 feet, at the foot of Switzerland’s highest peaks. It lies about 6.2 miles from the Theodul Pass, standing at over 10,800 feet high, which borders Italy. The name Zermatt is from a German word “matten” or valley. 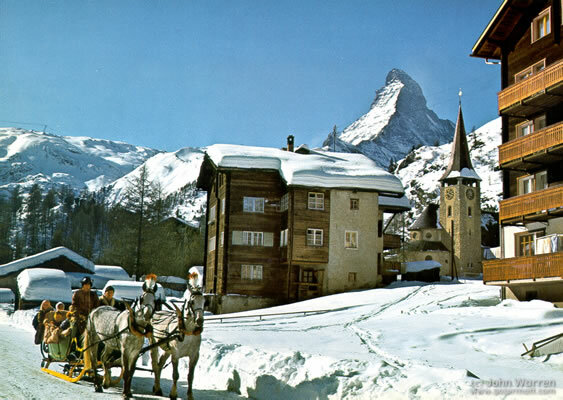 The name first appeared as Zur Matte or at the meadow and later became Zermatt. It didn’t appear on maps until 1495 and then 1546 in texts. The older name of Zermatt was actually Praborno or Prato Borno, (prato also meaning meadow), and appeared in older maps as early as thirteenth century under this name. The French speaking people from Aosta Valley and the French speaking part of canton Valais used this name until about 1860. The name changed from Praborno to Zermatt when the Romance language speaking people were gradually replaced by a German speaking colony. Zermatt was actually an agricultural community until the mid 19th century. After the first and tragic ascent of the Matterhorn in 1865, people came in to Zermatt, leading to the construction of many tourist facilities. To prevent air pollution and to prevent obscuring the town’s view of the Matterhorn, the entire town is car-free zone. Almost all vehicles in Zermatt are battery driven and almost completely silent. 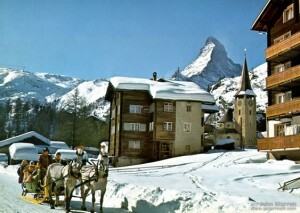 So when you get to Zermatt, you will catch sight of the cobbled streets and horses with sleigh waiting for their rides. The air is absolutely fresh and you will be impressed that there are no tour buses, fumes from cars and cars honking. Zermatt has 29 mountains that are over 13,100 feet, has nine out of ten highest mountains in Europe, has the highest ski lift in Europe (which is Klein Matterhorn and is 12,830 feet), has the largest summer skiing area in the Alps, has the longest winter skiing season in Europe and has the longest open ski run in Europe (which is Klein Matterhorn to Zermatt). 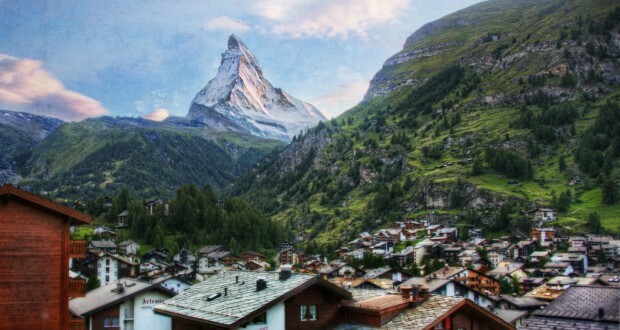 Zermatt’s local language is German but English is spoken throughout. When skiing, boarding or hiking, sometimes you can get injured. But don’t worry, Zermatt has 5 doctors, 1 dentist and 4 pharmacies. For emergencies, police are available via the number 117 and ambulance via 144. If you’re up in the mountains, you can call helicopter air rescue by dialing 1414 or by radio on 161.300 MHz and for Air rescue (only in Valais), it is 1415. These numbers are important to remember in case of emergency! Zermatt is without a doubt one of the best places to go whether you want to ski, hike or just to relax and get away from it all. Walking through the cobbled paths of town, between the ancient sunburnt barns and chalets, you catch your first glimpse of the Matterhorn and you know you have come to the right place.